Commissioned for active duty on July 12, 2003, the USS Ronald Reagan is the most modern and sophisticated aircraft carrier in the world. The USS Ronald Reagan is 1,092 feet long and is home to 6,000 sailors. It carries more than 80 aircraft and cruises at speeds in excess of 30 knots. Nothing testifies more to Reagan's legacy, and his belief that only a strong America will be a free America, than the USS Ronald Reagan. 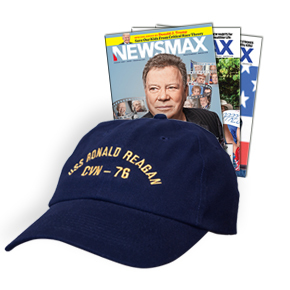 Now you can celebrate one of America's greatest presidents, and remind Americans of his legacy, by getting the USS Ronald Reagan Cap. This is a high-quality six-panel 100 percent brushed cotton hat featuring reinforced sweatband, pre-curved visor and adjustable fabric strap with a brass buckle. With its embroidered lettering, this hat looks great and is made for optimal comfort and durability!